These are possibly my favourite bar cookies – they are so simple to make and they are really moreish! 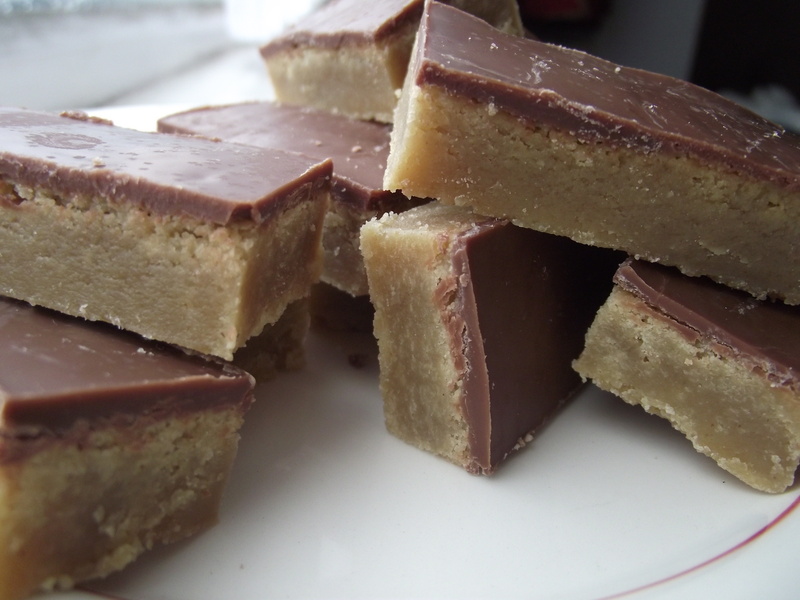 They are essentially a simplified version of millionaires shortbread/caramel slice: the caramel and shortbread is combined in one layer. When Tom was in Afghanistan this time last year, my mum bought a set of vacuum pack bags so that I could post homebaked goods to him. Some parcels took about 3-4 weeks to get to him so I came up with things that would last long enough and travel well. 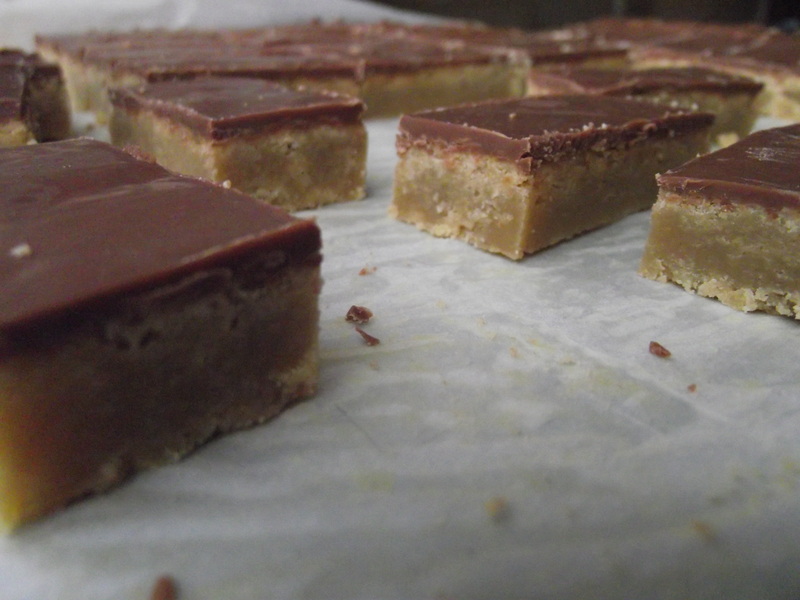 These toffee bars were one of the things I made for him. I still had some of the bags left so I decided to make them last week for Kim, one of Tom’s friend’s who is currently in Afghanistan. The recipe is from my favourite non-cupcake book: The Cookie and Biscuit Bible. bought it years ago and I haven’t seen it anywhere for a while but if you see it, I’d recommend buying it! Line a 13 x 9 inch tin (I use a 10 x 12 inch tin) and pre heat the oven to gas mark 4. Beat the butter and sugar together until creamy. Add the vanilla and the egg yolks one at a a time and beat until combined. Add the flour and stir in until combined. Spread into the tin and bake for 20-30 minutes until gold brown on top. Take out the oven and immediately place the milk chocolate on top and leave to melt. Once melted, spread out to evenly cover the top and then leave to cool completely. Once completely cool slice up (I cut mine into 1 x 2 inch bars) and enjoy. Your Aunt Joan told me about your site….Its adorable! 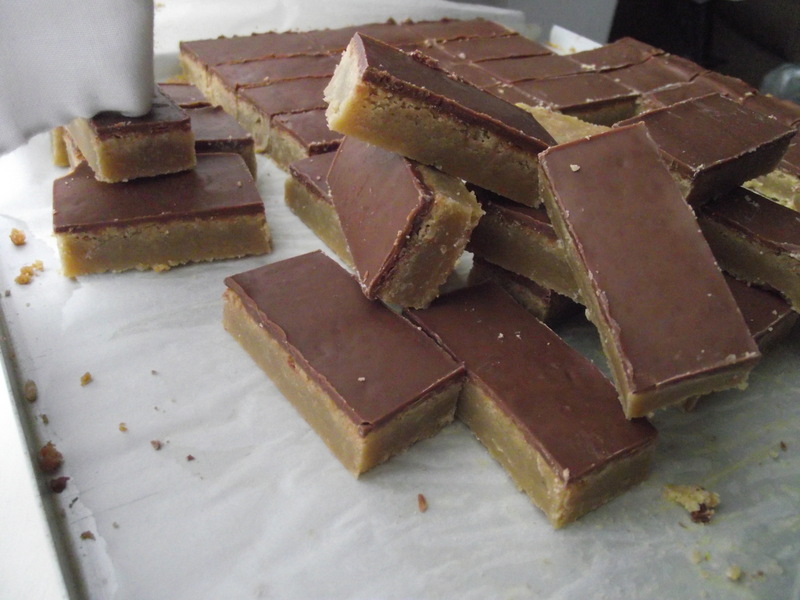 I want to make these toffee bars soon..but need to convert amounts..found your conversion table…now to do some math!..What temperature do I use for these bars?